Plate V. 16. 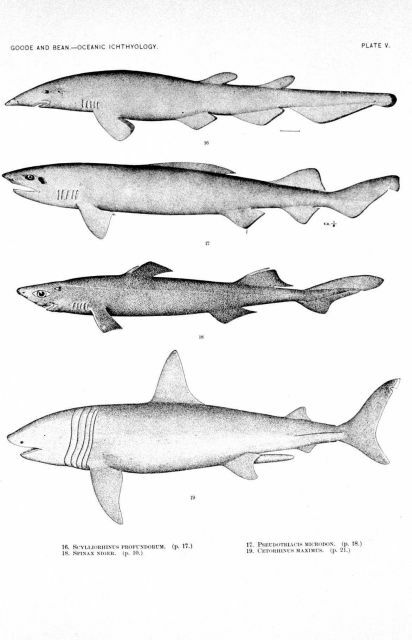 Scylliorhinus profundorum, Goode and Bean. Collected at N. Lat. 39 09, W. Long. 72 03, in 810 fathoms. 17. Spinax niger, Bonaparte. Drawing from Bonaparte, Fauna Italica. 18. Pseudotriacis microdon, Capello. From Amagansett, New York. About 1/17 natural size. 19. Cetorhinus maximus, Gunner . From Annales du Musee d’Hist. Nat. Paris.